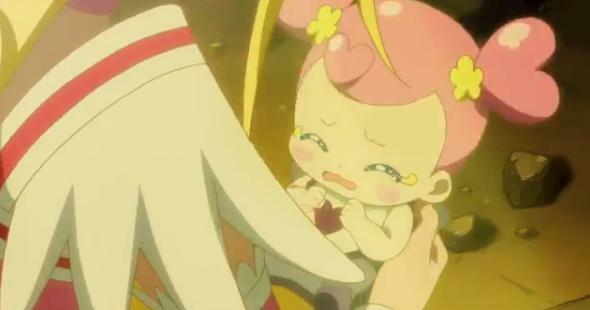 Last week, Cure Kiyoku wrote about episode 37 of DokiDoki Precure, which explored the importance of appreciation for vegetables. This lesson was very much in line with what we have learned about the importance of vegetables from Cure Dolly. In Cure Dolly’s previous article, she also taught us about the Japanese virtue of enryo, or self-restraint. 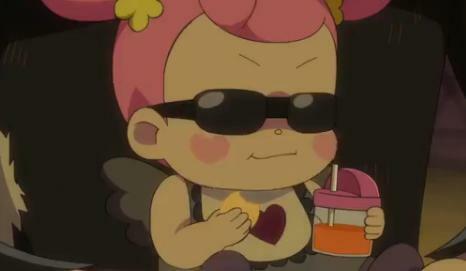 Interestingly enough, the next episode of DokiDoki Precure, episode 38, is about enryo. At the beginning of the episode, we see that Ai-chan is doing very well. She is learning to be a very good girl. She is throwing less and less tantrums. We also see that being a good girl means practicing enryo. Ai-chan is told that she can not eat too much or drink too much. 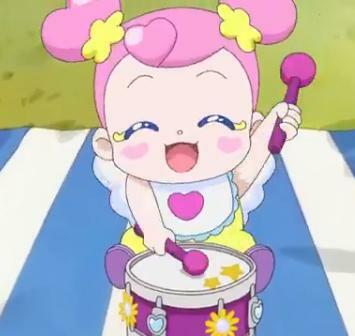 She accepts that without complaining, and because she is good, she gets the reward of playing with a drum. Of course, the villains have to try to spoil all of this, and they kidnap Ai-chan to try to turn her into a Selfishness. To do this, they give Ai-chan anything she wants, whenever she wants it. They give her as much to eat and drink as she wants, and they let her do anything she wants without restraint! For a time, this works. Ai-chan does become a Selfishness for a time. This is very much like the temptation faced by Candy-chan in Smile Precure. You can read about it in Cure Dolly’s article, The Philosophical Riddle of the Ball of Neglect. In DokiDoki Precure, this temptation is even more virulent. Ai-chan starts to become rather nasty. She throws temper tantrums and even becomes a bit violent. 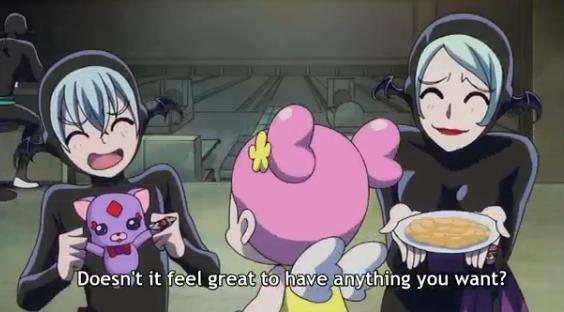 In Smile Precure, Candy-chan is able to resist the temptation by remembering a lesson from Miyuki-chan regarding the pleasures of shared treats. 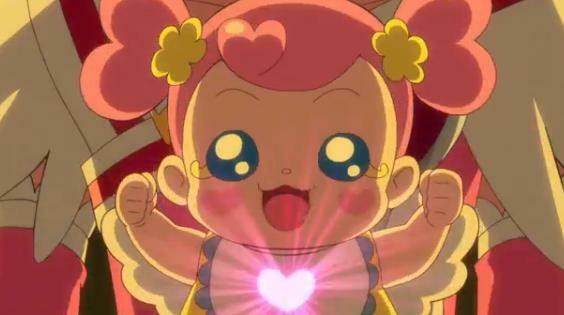 In DokiDoki Precure, it is Cure Heart that rescues Ai-chan. She is able to rescue her with love. She tells Ai-chan how much she loves her, and how happy Ai-chan makes all of the girls. She reminds Ai-chan of the fun that they have all had together. In the modern world, this would seem to be a poor antidote for being able to have everything one wants whenever she wants it, yet, this frees Ai-chan from the Selfish Kingdom and restores her heart! It seems that love and enryo are very much intertwined. Oh yes, from the previews it looks like Regina-san is back. I am quite interested in seeing what will happen next.